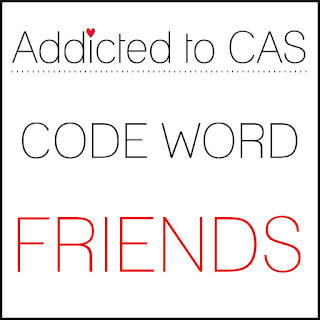 Before I get onto my Addicted to CAS Card tonight. A quick update on my blog candy. I want to do a separate post on that as I want to devote some space to your responses to my question. Consequently, I will be back later on Saturday with that post - and will announce the winner. Our guest designer for this challenge Guest Designer - Izzy has a great card to share with you. So, I hope you will check out her blog. For me... I wanted to go back to a favorite of mine from Altenew - Fresh Freesia. I love this stamp set. Although..... I really hate to admit it... Freesias aren't one of my favorite flowers. I know.... horror.... I love them and I love the color of them... but I just didn't grow up with them as a child. For me... it's daffodils and tulips and iris .... Long story! BUT... I do love this set from Altenew. It's such a fabulous set to color. I stamped the Freesia onto 80# Neenah Solar White card stock. Once it was colored, and I had added the sewntiment, I added some flicks of shimmery gold watercolor splatters. Why is it that MY splatters never seem to look as artistic as the splatters that other card makers add to their cards, I think it's the same problem that I have adding embellishments, like enamel dots. They NEVER seem to land in the RIGHT place! I do love that sentiment, though. How true is that? I hope you will join us and play along with my friendship theme this week. We would love to see what you create. If you are looking for some inspiration, you have to look no further than the fabulous cards from our very talented deisgn team. I'll be back later in the day with my blog candy winner post. In the meantime, warm hugs and prayers for those of you who need a little lift tonight.